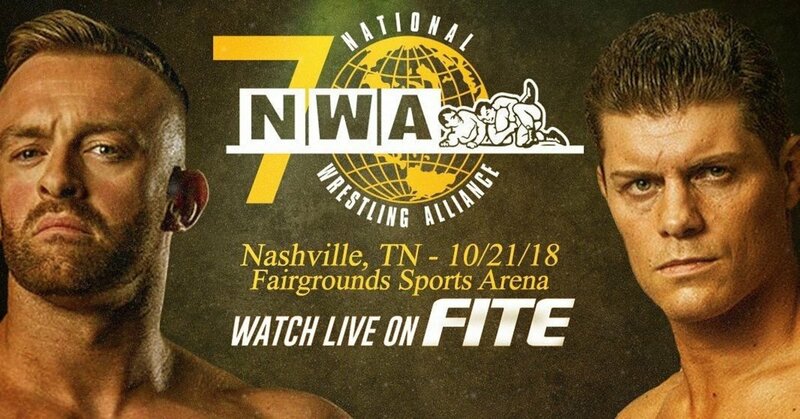 The NWA celebrates its 70th anniversary at the Nashville Fairgrounds tonight. The 70th Anniversary Show will be headlined by Cody Rhodes defending his NWA Worlds Heavyweight Championship against Nick Aldis. Cody won the title from Aldis at All In, and Aldis is getting his rematch in a two-out-of-three falls match tonight. There will also be a one-night tournament to crown a new NWA National Champion. Two fatal four-way elimination matches (Willie Mack vs. Jay Bradley vs. Mike Parrow vs. Ricky Starks and Colt Cabana vs. Sammy Guevara vs. Scorpio Sky vs. Sam Shaw) will decide who advances to a singles match for the title later in the night. In another title match, Jazz defends the NWA Women's Championship against Penelope Ford. Plus, Former NWA Champion Tim Storm takes on Peter Avalon, Jax Dane & Crimson (w/ Road Warrior Animal) face The Kingdom of Jocephus, and Laredo Kid wrestles Barrett Brown. Our live coverage begins at 7:05 p.m. Eastern time. There were some technical problems at the beginning as opening video has live audience audio. Joe Galli, Tony Schiavone and Jim Cornette welcomed us to the Asylum at the Nashville Fairgrounds and ran down the card. Same audio issue as Colt Cabana and Sammy Guevara were interviewed in the back but we were hearing the commentary team. Scorpio Sky did a video promo, then it was time for our opening match. Fast paced, entertaining but rushed opener. Shaw was established early as the powerhouse in the match. Sky and Guevara did a nice double plancha, and Guevara hit a shooting star press to the outside. Shaw pinned Cabana with a powerbomb off the rope -- much to the disappointment of the crowd who loved Cabana. More crazy dives by Guevara. but he was pinned by Sky -- who got superkicked by Shaw straight after for the win. There was a Blue Demon Jr. interview after more technical issues where he stated he wants a World title match at some point. Cornette, who’s been great on commentary so far, gave some more history. Another entertaining but rushed feeling match. Laredo Kid started hot and hit an Asai moonsault. Brown cut him off with a dropkick coming off the ropes and then hit a dive to the outside. A flip DDT got a two count as Brown continued to control the match. Laredo Kid made a comeback and hit a 450 off the apron to Brown on the floor. hit a slightly botched reverse rana, and both men were now selling big. Laredo Kid got a two count after a cutter off the ropes but missed a corkscrew off the top. Brown countered with a running knee to the face for the victory. Laredo Kid looked great here and the match would have been so much better if they had had five more minutes, but they seem worried about time. No audio again for the backstage interviews and promos as James Ellsworth appeared with Mike Parrow. Audio really letting down what has otherwise been an excellent production so far. Ricky Starks cut a promo by the commentary position to introduce his elaborate intro video. Magnum TA was now at ringside for an interview segment and name dropped all the NWA legends and put over the NWA. He’ll be presenting the NWA National title later, Magnum was better here than 90 percent of modern wrestling promos. Good, solid match. There was a big man battle early between Parrow and Bradley with Parrow getting a two count off a sit-out powerbomb. Starks came in and caught Parrow with a roll-up and a handful of tights to eliminate him. Classic shine and eliminated formula in these four-ways tonight. Bradley hit a final cut and butterfly suplex on Starks and was dominating the ring. Bradley got caught going to the top rope, got powerbombed by Starks, and then a splash from Mack eliminated him. It was down to Starks and Mack. A stunner by Mack after a nice exchange got the three count, and he advances to face Shaw in the final. Bradley jumped Mack during a post-match interview as Shaw caused the distraction to establish Mack as the underdog going into their match later. Ellsworth came in and ducked during an attack that sent Bradley into the post. Avalon cut an in-ring promo, bragging about his prior victories over Storm and heeling on the crowd. Storm grabbed the mic and announced a kiss my foot stipulation. Avalon jumped Storm at the bell but was quickly cut off by the former NWA Champion who took control. Storm dominated until Avalon's manager (Nikko Marquez) created a distraction that allowed Avalon to get some offense in. Avalon accidentally hit Marquez while he was holding Storm, then Storm caught Avalon in the Perfect Storm for the win. Post-match Avalon forced Marquez to kiss Storm's foot instead -- but Storm didn't accept that and forced Avalon to kiss his foot too. Weakest match on the show so far, but it was very entertaining for what it was and didn’t drag on. Had a real old school feel with the stipulation and Storm was over big with the audience. Jazz cut a promo and they were putting her over huge as a legend of women’s wrestling. Sound problems again for Ford's promo. Cornette put over Mildred Burke on commentary. Ford hit a handspring cutter, handspring elbow, and a Northern Lights suplex. Jazz regained control with a clamp, but Ford kicked out. Jazz was working as the overconfident, dominate heel. Ford came back with a couple of roll-up attempts but missed a backflip. Jazz had the three count with a Michinoku driver, but Earl Hebner only counted two and then stopped. Jazz put Ford in an STF and got the submission. Both worked hard, and Jazz looked good and had a great presence, but the finish really hurt the match and Ford was off in places tonight. There was a post-match interview with Jazz where she announced that she wants a shot at the NWA Worlds Heavyweight Championship. Jim Cornette was in the ring for an interview with Jeff Jarrett and put over Double J and the whole Jarrett family. Jarrett talked about the NWA and thanked the crowd for continuing to support the company. Jarrett introduced the new NWA National title and put over Magnum TA. Mack jumped Shaw as he was making his intro as payback for earlier in the show. Mack missed a charge in the corner, allowing Shaw to take control. Shaw used slow, deliberate offense including an old school nerve hold, leading to the almost as old school hand drop spot. Mack got a hope spot but was quickly cut off by Shaw. Shaw put on a chinlock, which led to another hand drop spot. Mack hit an exploder suplex, and Cornette was putting him over huge as the underdog who came from nothing. Mack made his comeback with a cannonball, a Samoan drop, and hit a standing moonsault for a near fall. Shaw went up top and misses a swanton bomb. Shaw walked into the stunner for a big two count. Shaw came back with a superkick that got two, but he missed a second superkick and Mack hit a second stunner to become the NWA National Champion. The match was plodding when Shaw was on offense, but the crowd loved Mack as the underdog. Very old school match structure and physchology that might turn off some, but it worked well in front of this audience. Nick Aldis did an interview where he teased having his own manager to counter Brandi Rhodes in the main event tonight. Very Nick Bockwinkel style delivery here by the former champion. Jocephus did an interview on the ramp teasing that his spiritual advisor and Hollywood from GLOW would challenge Dane and Crimson, but it was a distraction to allow Shannon Moore and Crazzy Steve to jump Crimson & Dane from behind. The heels dominated early before Crimson hit a spinebuster, brought in Dane on a hot tag, and Dane hit a double Samoan drop. Crimson & Dane hit a Samoan drop into a cutter for the victory. Quick match that lacked heat and felt like filler. Post-match Jim Cornette interviewed Animal -- who announced that the Crockett Cup will return next year. Dory Funk Jr. was interviewed at ringside. He told a story about watching NWA as a seven year old, talked about his dad, and put over the NWA. These interviews with the legends have done a nice job of putting over the legacy of the National Wrestling Alliance tonight. Tony Schiavone re-joined commentary to call the main event. The former NWA Champions who have been on the show tonight came into the ring as the ring announcer introduced Aldis, who comes to the ring with Kamilla Kaine. Cody entered with Brandi and shook hands with Dory Funk Jr. They did a handshake at the start of the match and it was solid technical wrestling in the early going. A delayed suplex and flatliner by Cody got the first two count. Aldis hit a brainbuster, and Cody came back and got a two count with a Disaster Kick. Aldis responded with a superplex, but Cody quickly picked his leg and locked on the figure four. Aldis got to the ropes and locked on the cloverleaf for the submission to take the first fall. Aldis was selling his leg from the figure four and Cody was ready to start the next fall. Commentary was pushing the idea that Cody did more damage and it was clever strategy by Cody to tap quickly when he realized he couldn’t make the ropes. Aldis wasn't ready at the bell -- so he went to the outside, Cody hit a tope as they brawled around ringside and then into the crowd. Aldis whipped Cody into a wall and Cody responded with a trash can. The brawl went through the concession stand before Aldis slammed Cody on the ramp. Cody set up a table in the corner of the ring, and commentary was pushing that the referee will give them freedom as he doesn’t want to disqualify anyone. Aldis hit a DDT and got ready to put Cody through the table. Brandi came in the ring to save Cody. That brought brings in Kamilla Kaine, but it was Aldis that hit Brandi with a running knee from behind. Cody hit a superkick, then Aldis avoided Cross Rhodes and a moonsault attempt by Cody. Cody hit the flip, flop and fly. Both men went for a clothesline, which led to a double down in the ring. Kaine and Brandi got into a fight at ringside and the referee had enough of it -- so he ejected everyone from ringside. The distraction allowed Aldis to hit Cross Rhodes for a two count. Cody picked the leg again and put on the figure four, but Aldis made it to the ropes. Cody landed a draping DDT, and Aldis responded with a tombstone and hit an elbow off the top for another near fall. It turned into a slugfest in the center of the ring. Aldis went for the cloverleaf -- but Cody’s boot comes off. Cody got a small package, then Aldis reversed it for the three count to regain the title. Excellent main event that went around 30 minutes. The finish caught the crowd by surprise which hurt the reaction, but it was a really well-structured match. The commentary team thanked us for joining them as Aldis celebrated in the ring. An entertaining show that went by quickly. Except for Sammy Guevara in the opening match, this felt like a very old school presentation inside the ring -- which is a brave strategy in 2018 and it will be interesting to see how successful the brand is going forward. The talent on the card was thinner than most major indie groups and it showed at times. The technical issues were cleared up by the end of the show and I really enjoyed the commentary and realistic presentation.